Why would a rising Hollywood star leave it all behind and enter a monastery? 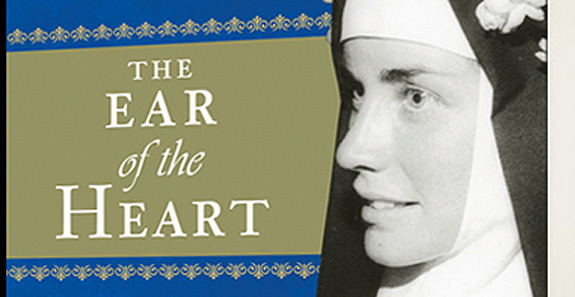 The fascinating story is told in full in The Ear of the Heart: An Actress’ Journey From Hollywood to Holy Vows (Ignatius Press, 2013), by Mother Dolores Hart, OSB, and Richard DeNeut. It is especially timely during this Year of Consecrated Life, which began on the first Sunday of Advent and concludes on the World Day of Consecrated Life on February 2, 2016. Even if you haven’t heard of Dolores Hart, you have probably seen her. She has the distinction of appearing in not one but two Elvis Presley movies—Loving You and King Creole—as well as many other box office hits. Written, over many years, with Richard DeNeut, a Hollywood PR man (and a former suitor), The Ear of the Heart is part autobiography, part biography. I first set eyes on Dolores Hart during Christmas 1977 when the BBC showed a season of Presley films following his death earlier that summer. She always played the “good girl” who saves the hero from crime and much worse—often an older siren. Of course, to my 12-year-old eyes, this beautiful actress was welcome to save me too, anytime she liked. And there it stayed for years until I read somewhere she ended up a nun. Stranger things have happened, I thought, but I did wonder how that had come about. Later searches on the internet came up with information as general as it was vague, leaving me none the wiser. So, when I spied this publication of her life story, I ordered and then opened it eagerly, all in the hope it would fill in the gaps. It did. But, what I also found was something much more besides. For some reason, I expected Dolores to have come from a privileged background, albeit one with heavy doses of Catholicism—a la Grace Kelly—only to find that her upbringing couldn’t have been more different. For a start, her mother was almost forced to undergo an abortion once it was discovered she was pregnant with the future star. Thankfully, she refused, and instead, with parents hastily wed, the child lived. That said, the family home was not only not Catholic, but also deeply unhappy. Her father, a handsome but struggling actor, was violent and soon the marriage fell apart. Consequently, young Dolores was constantly on the move, changing both locations and family configurations. Then something truly miraculous happened. In 1946, aged just eight years old, Dolores decided to become a Catholic. This was even more remarkable given that she had only ended up at the local Catholic school on account of it being the closest to where she was then living. The local priest, however, was initially hesitant. Then Dolores’ mother appeared, and told the priest that if he didn’t instruct her daughter she would come back and smash every one of his stainglass windows. Dolores was soon after baptised; from then on the book chronicles how her newfound faith became the guiding force in her life. Her entry into Hollywood was as sudden as had been her conversion. She was spotted in a photograph and brought to the attention of the legendary producer, Hal Wallis. Soon after, aged just 19, she found herself on a set with Elvis, and the rest should have been movie history—only it wasn’t. Two movies don’t make a career, and she had to fight her corner like all the rest. Along the way she lost out on as many parts as she got, but stuck at it nonetheless, and was just on the brink of major stardom when she quit. A visit to Reginia Lauds Monastery in Connecticut had awakened something that, for a long time, she did not understand. Subsequent visits there unsettled her even more, whilst all the time feeling inexorably drawn to the contemplative life. In the meantime, it didn’t stop her from getting engaged, and trying to carry on as normal, but, of course, it was all to no avail—instead, it was to be the veil. In the end, she asked for and received admittance, leaving behind a trail of bewilderment, and some good wishes, back in Hollywood. Touchingly, one of the few who did call her, simply to say he was praying for her, was Presley. The second part of the book concentrates on her new life in the cloistered silence. It is a shock to the reader, so glittering and fast paced is the first part. One suspects, however, not half as much of a shock as it was for the young postulant, who, during those early years, cried herself to sleep. She talks frankly of the life she chose: its joys and demands, challenges and unexpected discoveries. Unlike her movie career, she did not simply “stick at it”, but, instead, courageously allowed herself to be drawn—painfully at times—ever more deeply into its Mystery. Some 50 years later, after having entered with such agonized and tentative steps, she remains a Benedictine. The “objective” biography part of the book is written by DeNeut; it interspersed with long quotations from Mother Dolores. The dual voice works, giving the sense of a good conversation, and a lively one at that. And, as one would expect, the book’s subject has much to recount, all of which is as witty as it is well observed. The Hollywood years have the edge though, especially with their wonderful “walk on” cast of stars. The anecdotes from that time—some humorous, others sad, many touching—are never dull, a reflection no doubt of the company of this former starlet herself. I have waited a long time to find out about the girl in King Creole. Lavishly illustrated, The Ear of the Heart is as readable as it is memorable; it was definitely worth the wait. Many years later, talking of the young star’s decision to leave the world, the actor Karl Malden said: “She could have been as big as Elizabeth Taylor … I love her for her decision”. As I closed The Ear of the Heart, I could only but agree.